Disclosure: This is a sponsored post. All opinions stated however, are genuine and belong to the authors. Post written by my 2nd oldest son and his girlfriend. 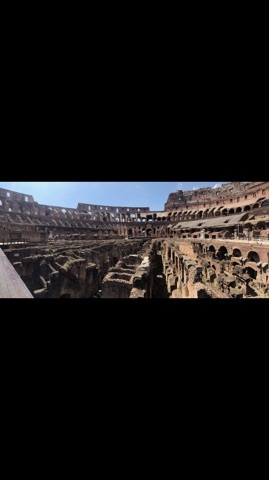 If you haven’t been to the Colosseum before it should definitely be on your bucket list. It is one of the most remarkable structures you will lay eyes on. Walking through it while hearing the history lets you picture what it was like to live in the life of a Roman citizen in the first century. Josh and I were fortunate enough to get to see this wonder in our time in Rome. We used a tour through a group called The Roman Guy which was extremely informative. We met the group under the green tent behind the Colosseum and they escorted us into the line with our tour group and leader. There they provided us with a headset and the plethora of facts began. Our group leader was an archaeologist who you could tell had a heart for the Colosseum. She knew everything that you could think of having to do with this site. Now my favorite part about using The Roman Guy was we were able to start the tour out by going through the floor level of the Colosseum! It was perfect for getting to see the place up close. The floor level isn’t open to the public so I was very excited when Josh informed me we would be going down there. The stories she told painted a vivid picture of what each part of the building did. There are rooms and sections that fill the bottom where they would keep animals and gladiators and soldiers. They even had ancient elevator type structures that would raise the opponents up through the floor into the arena. We were able to see the seats of where the higher order citizens of Rome would have sat as well as some of their names still carved into the marble. The Colosseum was actually designed for the citizens to have something to do and they would even provide food. Over the years earthquakes, elements and other things destroyed parts of it but they have worked to reconstruct parts to make it as close to how the original would have been. After the Colosseum Arena Floor Tour we went through the top levels, through the sides and then out to the Roman Forum. I would recommend doing this tour during a cooler month because it got hot and there was not a lot of shade. If you go during the summer make sure to wear light clothes and bring a water bottle. There are spots throughout the forum with these cool spots of running water to refill your water with. And bring sunscreen! I still have weird tan lines from my shirt I wore on the day of the tour. We worked our way through the Roman Forum and ended the 4-hour tour a little before dinner time. There are gelato spots all around the site that our guide suggested to cool off with. It was an amazing experience to share together and could not be more grateful for the experience provided by The Roman Guy for the tour. Your favorite co-writer here, Joshua. I had mixed feeling about the Colosseum. The structure from the outside put every picture you have ever seen of it to shame. The inside was impressive in its own respect. Personally I build things for a living, have built houses from the floor up, renovated mini-mansions, laid marble and flooring worth more per square inch than I make in a year. So for me, I appreciated the quality and magnitude of the structure, knowing how much work it takes to merely put a room together, much less a 600 ft. (183 meters) structure, so in that aspect and regard I was floored. It was a marvel. renovations ....not to take away from the tour itself because the tour was very good. It had a lot of benefits such as going in early, skipping lines, seeing restricted areas, getting a history lesson of what’s original and being able to lay your hands on an almost 2,000-year old carved piece of history. All of that in itself was beyond worth the tour from The Roman Guy. After rummaging through the Colosseum (*spoiler alert* get ready for a leg work out), you get taken to the Roman Forum and Palatine Hill. It is about a 10-minute walk and you will likely be approached by a few charming street merchants who want to take pictures of you with the gorgeous landscape in the background, rent you a Segway, or talk you into buying something from them. I figured it to be part of the experience so I enjoyed haggling and verbally sparring with a stranger over paying a price for something I didn’t particularly want or need because I felt guilty/obligated due to their kindness ... once you make it through that gauntlet you reach security before entering the Roman Forum and there I had no mixed feels. It was an absolutely beautiful place!! The stories behind each building, the things people did, the purpose of each building, the landscape, background... It was a place you could just sit and look at for hours not saying a word while just trying to soak in and process the unalloyed beauty of your surroundings. Along the way your ear is filled by your tour guides' voice, comparable to a talking encyclopedia along the way, Just as you start to get tired and thirsty, there is a fountain of water and a boulder or stone bench to rest on. All-in-all, 4 hours to tour is a significant amount of time, but ultimately it was 2 separate tours: one of the Colosseum and another of the Roman Forum, so the time frame is justified, especially considering it's one of those things you can do once in your life and not come across an experience to rival it. That being said, even if cutting the lines was the only perk the Roman Guy tour offered, it would be worth it, BUT there is so much more you are bound toward. 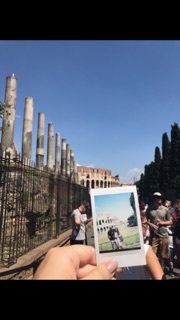 A big thank you to Josh and Kiera for writing (I truly enjoyed reading their perspectives and seeing their photos), and to The Roman Guy for making their experience in Rome, Italy so much more special. If you are headed to Italy (and/or Paris) now or at any time in the future, be sure to bookmark the Roman Guy website. I have been to the Colosseum, and though I loved it, at that time I hadn't heard of this tour company, and we did the trip on our own. It was beautiful to see (amazing, wonderful, fantastic, in fact), but we didn't get to learn about anything we were looking at, nor did we get to skip the lines (oh how I wish we would have had that perk), and we certainly didn't get to see ground floor like Kiera & Joshua did (going lower-level would have rocked!)! As a side note, I agree with my son (Josh), that the Colosseum is extraordinary and a do-not-miss visit, but The Roman Forum...touches you. I loved both areas, but I could have stayed in the Forum for days!!. You can learn more about the reasonably priced, comprehensive and ahmazzzing tours offered by The Roman Guy, by visiting their website. You can also follow them on Facebook, Twitter, Instagram and/or Pinterest. That would great to see that in person. I would love to see this in person. I'd have to stop and rest often though. My hip yells at me when I walk too much. I love their perspective on their vacation. The tour guide often makes all the difference (both positive and negative). Thank you and your co-writers. Roman Guy sounds like the best way to see the ancient architecture. I would love to see these with the family. I would love to visit Rome someday and see the Colosseum. Sounds like you had an amazing time! I would love to see the Colosseum! I am so fascinated by how advanced ancient Roman culture was and how some of their structures have stood the test of time. Sure sounds like a leg workout indeed, but worth every step. Sunscreen is always a nice addition when out for 4 hours haha what it must have taken to build that way back when. I would looooove to see this in person. My sister is going there in October and I am super jealous. I would absolutely love to experience this place! It's definitely going on my bucket list! 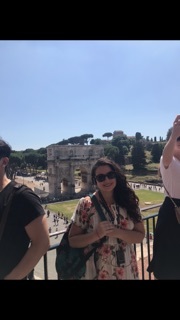 Rome is such a nice place to visit with family and it is a great experience for me exploring that place and learning about their history. I've been hearing awesome things about this tour and I think it's a great choice especially if it's your first time in Rome! I just love the fact that it's so hassle-free and enjoyable! A visit to Rome is on my bucket list. Love the photos, Rosey. This would be awesome to see. Thanks for sharing the details and your impressions. I think it would be so emotional seeing the colosseum considering the history of the place. What an awesome experience they got to have! Wow inside of the roman colosseum looks incredible. Stooped in so much history I bet it feels amazing to see for real! I will have to look into this tour company. My husband mentioned visiting Italy for our vacation next year and it sounds like you had a great experience with them! I’ve been here and it’s absolutely beautiful, I love Rome. Wonderful pictures you have. The Roman Guys does some really great tours. We did City Wonders and it was a blast. Do you know what! I actually went to see the Colosseum a few years ago but we only saw it from a distance and we didn't go inside. I kind of regret that now and if I was able to go back one day, I'd love to go inside to see it. I can imagine all the rich history of that place. I've learned how important it is to have a guided tour versus doing it on your own. Yes you don't spend as much money but the downside is not knowing anything about what you're looking at. It makes you appreciate it much more knowing the history. I enjoyed reading their perspectives too. Wow! This sounds like an amazing location and touring service. I've always wanting to go to Rome, especially to the ruins, like the Colosseum. I'm fascinated with history and learning about the past. Thank you for sharing! This is so awesome and definitely on my travel bucket list! Isn`t the Colosseum amazing? I visited a few years ago and it left an impression on me. This is absolutely stunning! Rome has been on my bucket list for way to long! I would definitely visit the Colosseum! Wow! The place looks amazing and look at the architecture detail is top notch. Thank you for giving us a very good glimpse of what can be stored for us in this historic place you've visited. I have always wanted to go to Rome! It sounds like you had such an amazing time! I will for sure be adding this to my list of never ending places I need to visit. Rome looks amazing! I love the Colosseum! Glad you had a good tour! Such great views. I'd love to visit one day. So much beauty. Rome is in our bucket list and I believe that having a tour guide is a brilliant idea. Great post and will definitely refer to this post when we are ready for the trip. This is super stunning and amazing!! I would LOVE to go! We were so close to going years ago and I so regret not doing so. I love to go to places that are so historical. What a great adventure. What an amazing adventure! I'd definitely love to visit! What an amazing building, its so beautiful. How lucky you are to be able to spend time there and really savour the experience of being in Roman times. This is definitely on my list of places to visit in the future. It is filled with so much history and culture! 4 hours... That's one heck of a tour, Rosey. It looks beautiful. I've always wanted to visit Italy. It sounds like having a tour guide is definitely the way to go. Skipping the lines is always a plus! Thank you for sharing these amazing photos. It looks like such an awesome trip! I would love to visit here one day it looks amazing. That would be so cool to see! I like anything that shows old architecture! The Roman Guy does a really nice job. I have a friend who went thorugh them a while back. I love places with this much history. I would love to go there someday and see it in person. What a fun piece! I really like seeing this from other points of view! That looks amazing! I hope to one day get to see the Colesseum! It is high on my bucket list! I used to have a blog where I put my dream travels. 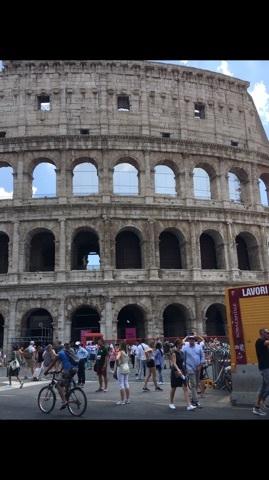 One of the photos that I put in the logo is of course, the Colosseum. Sigh...someday. The nearest that I have been to is the replica in Macau. A good view during a visit like this is always a plus! Would love to see this in person. 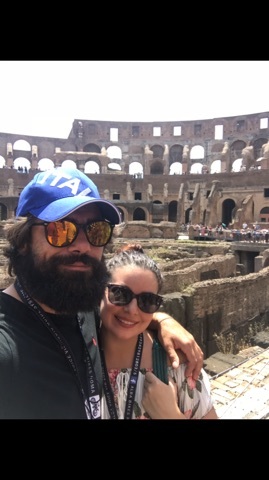 I am itching to tour there myself, but have thoroughly enjoyed Josh and Kiera's take on the Roman Guy Tour. I imagine, like Josh stated, it must be even more incredible to view in person. Sometimes photos just don't do justice to the actual structure. I very much love to visit historical places like this. Hope to visit Rome and all other parts of Europe soon. This country is very rich in history. I want to go back... and yes, your posts about ROME have me itching more than normal to travel! This is so nice, and I'd love to experience this area. I'd want to use The Roman Guy, too. Not overly stuffy and can help ensure you see the best sites and good eats! I'd love to see the Colosseum. In fact, I'd love to see all the ruins of Ancient Rome.